Charity, mom of three, didn’t think much of it when she first penned this Facebook post thanking a stranger. It was the next morning she saw how much her story had touched others. Overnight her post had over 160,000 shares. In the wake of recent tragedies and negative news stories, this story hit a soft spot for many. Lincoln’s (a sweet two-year-old) adoption was just completed by the Robinson’s in February. The family also have two biological children Tripp (age 3) and Abby Grace (age 12). They began Lincoln’s adoption process last August. The family knew Linc had some developmental delays from the beginning. He was diagnosed with expressive language disorder and sensory processing disorder. He started receiving speech therapy, occupational therapy and physical therapy in his home from THERAPY 2000 in September. When Lincoln began therapy, loud sounds scared him. Pulling a shirt over his head agitated him and tickling him might send him into meltdown mode. Therapy has helped him overcome these issues. His parents worked hard reinforcing everything Lincoln was learning in therapy throughout the other times he wasn’t in therapy. Their devotion paid off, Lincoln has made huge strides. He graduated from speech and physical therapy in March and occupational therapy this June. 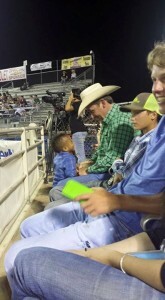 That’s why that night at the rodeo touched Charity. The fact that Lincoln was communicating and playing with a stranger, Mr. Taylor, at a loud venue was proof of how far he had come. That stranger has now become a friend as the Robinson’s learned he was a pastor at Bar None Cowboy Church in Tatum, Texas. The story was shared over a million times and landed the preacher and the Robinson family on Fox and Friends (http://video.foxnews.com/v/4309580436001/mom-posts-viral-photo-of-stranger-playing-with-son/?playlist_id=930909787001#sp=show-clips) and People.com (http://www.people.com/article/pastor-special-needs-boy-form-special-bond). Charity thinks the story went viral because people could relate to the same struggles and successes the family shared. Charity shared, “Raising little ones is hard. Raising a kid with special needs is hard. Sometimes you can feel alone.” This story touched many people who could relate. Not only is Lincoln special needs, he is also bi-racial and adopted. It is estimated that one in six kids have a developmental disability in the US. Many people who were inspired by the story have reached out to Charity through Facebook. 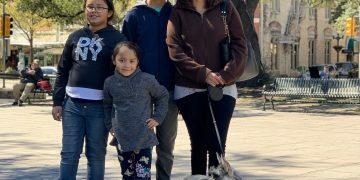 Families with children with developmental delays, adoptive families and families that now want to adopt are just a few of the segments touched by the story. The story hit home for many different people happy for Lincoln success. The humble Pastor Taylor shared another take on Fox and friends, “Lincoln doesn’t focus on the differences we have – if we focus on differences, it always divides. Lincoln just found the common bond, and that common bond is the love of Jesus.” Charity feels it all comes down embracing diversity. She shared, “No matter our differences at the end of the day we all want to be loved by one another. “ Sweet Lincoln is loved by his family, a new friend in Pastor Taylor and countless new friends across social media.